If you spend time hiking in California’s Sierra Nevada, there’s a good chance that you will find your way to a mountain meadow. The beauty and lush contrast of meadows compared to the surrounding forest make them favorite destinations. Meadows cover only a small fraction of the overall landscape, but are critical to the health of rivers and downstream water supplies. There are few places as majestic as a mountain meadow, and few landscapes that safeguard our rivers headwaters as well as a healthy meadow. Flowers and plants provide high-quality forage and provide habitat for rare and threatened species. Private ranchers, foundations, utilities, government agencies, conservation groups and others are all investing in meadow restoration as it becomes clear what a healthy meadow can provide. 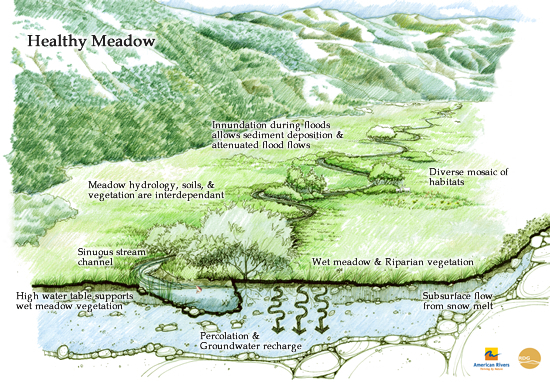 Meandering meadow creeks support high levels of groundwater, which replenish streams during dry summer months and create rich biological diversity. Human interference is the biggest cause of mountain meadow degradation. We started the cycle of erosion when we built roads and trails, overgrazed livestock, and ditched and diverted streams within meadows. The eroded stream in a degraded meadow drains snowmelt quickly downstream, drawing down the natural meadow water table and encouraging invasive species to take over. 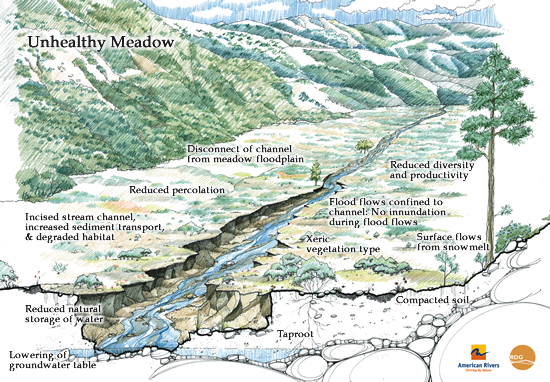 Degraded meadows cause a wealth of problems that affect the larger watershed. Over the last ten years, a series of meadow restoration demonstration projects in the Sierra have shown that large-scale meadow restoration can improve water supply, water quality, and habitat for fish and wildlife. 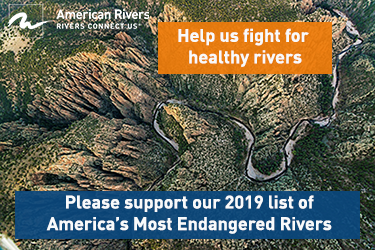 With assistance from the National Fish and Wildlife Foundation and others, American Rivers is taking this work to the next phase of implementation across the Sierra. Both rivers and ranchers benefit when meadows are restored. Healthy meadows filter and store water. This improves water quality and augments late-season stream flows, while providing habitat for fish and wildlife. Ranchers also benefit directly when restoration improves livestock forage on meadows that are grazed. Nearly half the meadows in the Sierra are privately owned, and many have been stewarded and protected by ranching families for generations. American Rivers working with partners to quantify the costs and benefits of meadow restoration on privately-owned meadows. We are working with ranchers to understand how to best craft win-win conservation programs that restore the Sierra’s working meadows. The West Fork of the Carson River meanders through Hope Valley into the Carson River Basin, providing valuable habitat for fish and wildlife and clean water for drinking and irrigation downstream. As an integral component of this interstate watershed, Hope Valley Meadow provides natural water storage, flood attenuation, cooling and filtering of water, fish and wildlife habitat, and is a popular recreational destination for visitors from throughout California and Nevada. However, while Hope Valley Meadow maintains important ecological and recreational value, the meadow’s ecological function and productivity have been reduced through historical land use impacts, such as heavy grazing in the 1800s. 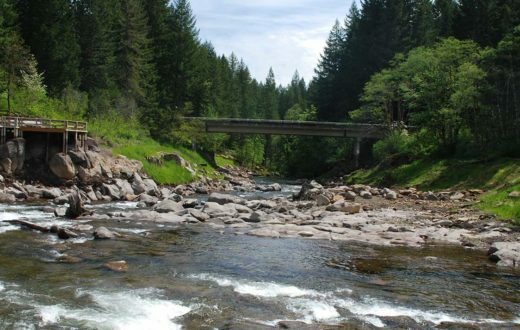 Through support from the Sierra Nevada Conservancy and National Fish and Wildlife Foundation American Rivers is leading an effort to assess restoration needs in Hope Valley Meadow and develop designs to improve the meadow’s hydrologic function and wildlife habitat. The project will repair the upper 400 acres of Hope Valley, including 1.8 miles of stream channel with the overall goal to enhance the full range of ecosystem services this highly visible and well-known meadow provides. 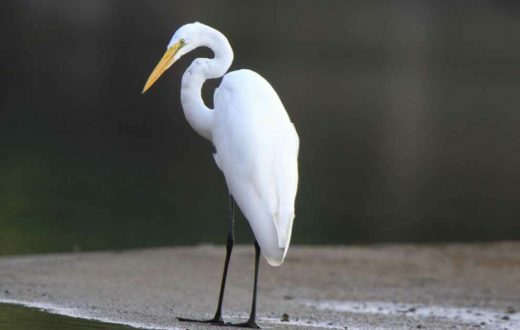 Collaborators in the project include the U.S. Forest Service, Alpine Watershed Group, Friends of Hope Valley, Institute for Bird Populations, Trout Unlimited, and the California Department of Fish and Wildlife. American Rivers is leading efforts to restore 280 acres of wetland meadow habitat in the northern Sierra Nevada. This innovative project will provide the first model of how to restore both cultural and ecological integrity to Sierra Nevada meadows while simultaneously integrating climate change predictions into the restoration design process. The Bear River courses through Bear Valley Meadow, providing cold-water stream habitat for rainbow and brown trout and habitat for special status species such as the willow flycatcher and yellow-legged frog, as well as an impressive annual display of wildflowers. Additionally, Bear Valley and the surrounding area offer a migration corridor and winter range for regional deer populations. Situated between the bustling Sacramento Valley and iconic Lake Tahoe, this project is critical to promoting meadow restoration throughout the Sierra for multiple reasons. Most meadows in the Sierra were and still are important cultural sites for Native Americans. Acknowledging and integrating these cultural values into meadow restoration will likely improve and further this type of work in the future. 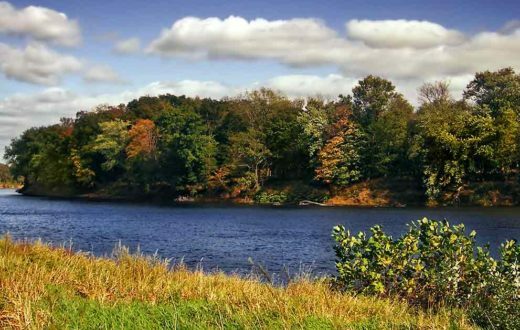 This project will also develop, demonstrate, and disseminate the hydrologic analysis needed to design sustainable meadow restoration projects. No other meadow restoration project in the Sierra has gone to such effort to quantify the potential for improving groundwater storage function as a result of meadow restoration. The Bear Valley Meadow Restoration Project is one of the few projects in the Sierra that is easily accessible to the urban and political centers of Sacramento and the Bay Area. The accessibility of Bear Valley provides an opportunity for decision makers to easily witness an on-the-ground project, thus promoting legislative changes that value and further meadow restoration efforts. Evaluating and Prioritizing Meadow Restoration in the Sierra. 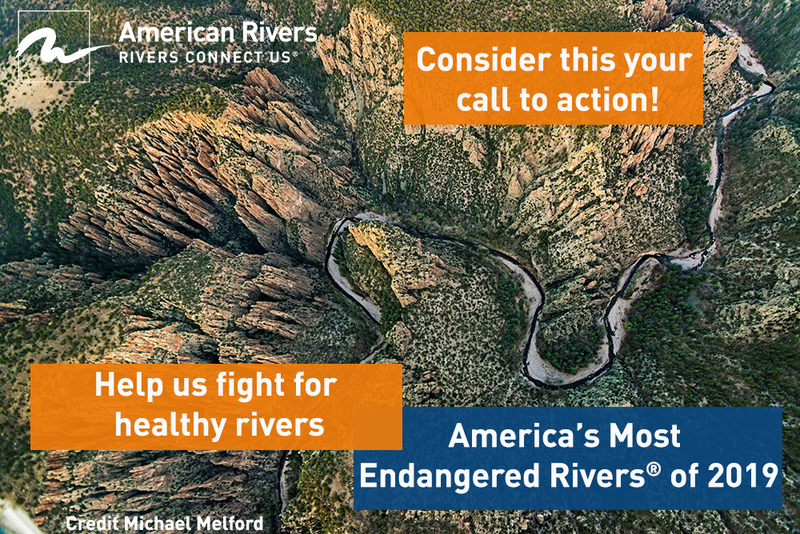 American Rivers and colleagues introduce tools to assess meadow condition, prioritize meadows for restoration, and monitor the effects of restoration. 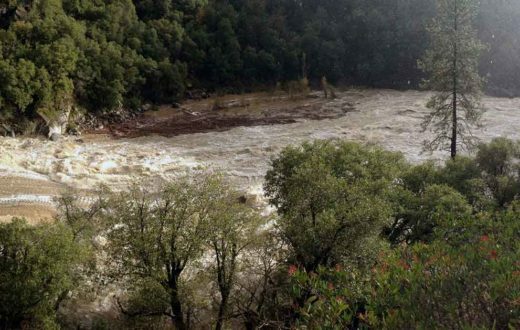 Data are presented for meadows in the Yuba and Mokelumne Watersheds. Meadow Scorecard: A Rapid Assessment Tool. Science staff from American Rivers and colleagues developed a rapid method for scoring meadow condition. The method is both rigorous and accessible to landowners and others without specialized experience. See also: “Evaluating and Prioritizing Meadow Restoration in the Sierra”. Monitoring Hydrologic and Water Quality Impacts of Meadow Restoration. American Rivers details methods to improve and standardize the monitoring data so we can better manage, evaluate and learn from past meadow restoration projects. Monitoring Vegetation Response to Meadow Restoration. Stillwater Sciences and American Rivers define standard methods for measuring vegetation response to meadow restoration in the Sierra Nevada. Forage and Cattle Response to Sierra Meadow Restoration. UC Davis, American Rivers, and Stillwater Sciences model how meadow restoration improves forage quality and productivity and ultimately cattle production. See also the MS Excel calculator, below. Forage and Cattle Response: MS Excel Calculator. This spreadsheet estimates increases in weight gain and carrying capacity following restoration. Monitoring Restoration on Private Lands. Privately owned meadow lands offer particular opportunities and constraints, when monitoring the effects of restoration. A Guide For Restoring Functionality to Mountain Meadows. Stillwater Sciences assesses meadow restoration techniques and post-restoration management options. Private and Publicly-Owned Meadow Lands in the Sierra Nevada. Maps and tables show the distribution of meadow land ownership throughout the Sierra Nevada. Rapid Assessment of Ecosystem Condition. 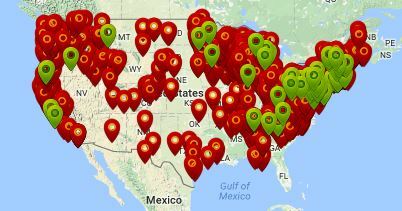 American Rivers introduced restoration planning tools at the 2011 Ecological Society of America conference. Here are some of the most frequently asked questions about flooding.